I had Bosc pears on hand that were just ripening, so I made a caramelized pear compote with butter, brown sugar and pears, splashed with a little apple whiskey which added a really beautiful flavor to the pears, and is the only whiskey that I like to sip straight now and then. For the cream filling, I whipped cream cheese with heavy whipping cream and a little sugar, and flavored it with both vanilla and almond extracts. 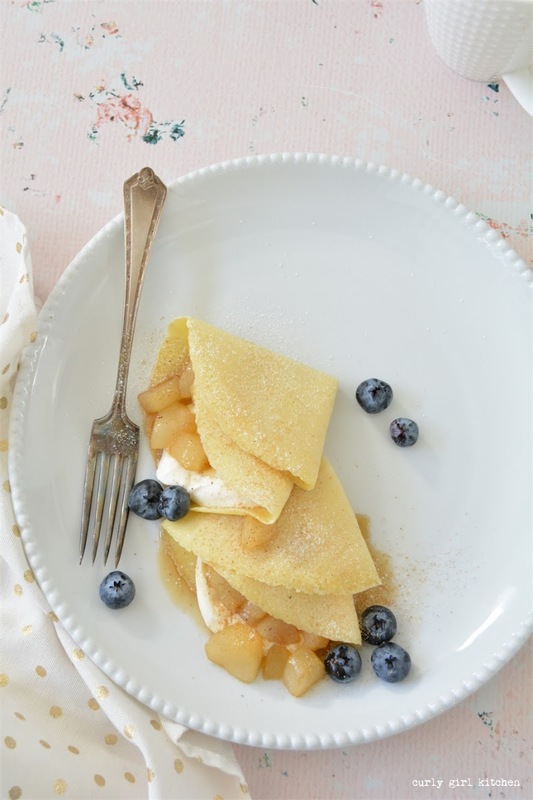 The pear compote spooned onto the sweetened cream cheese was a perfect combination of fall flavors for these crepes, and with a dusting of freshly grated nutmeg on top, I could have happily eaten a couple more of these. After breakfast, I browned butter for a cake for Thanksgiving, and thought about what else I might need to prep in advance for Thursday, but the truth is, we're keeping it fairly simple this year. My husband dry-brines and roasts the turkey while I do most everything else, and I plan a pretty classic menu. Mashed potatoes with plenty of sour cream, gravy from the turkey drippings, sweet potato casserole with pecan brown sugar streusel topping, homemade cranberry orange compote, braised brussel sprouts in apple cider vinegar, and a jar of boiled cider to drizzle over slices of turkey. No rolls or stuffing, though. And for dessert, apple crumb pie and brown butter pecan cake with ice cream. We'll have plenty of delicious leftovers through next weekend, which of course, is one of the best things about Thanksgiving dinner. I found a photo my husband took of me three years ago at Christmas, when we were picking out our Christmas tree. We were trying to get pregnant that winter, and a month after Christmas, we received the amazing news that I was pregnant with our first son. And now, here we are three years later with two beautiful, sweet, adorable little boys who make our family complete. We have so much to be thankful for. The crepe batter needs to rest for a few hours, or overnight. The easiest thing to do is whisk it up at night and refrigerate it overnight so it's ready to go first thing in the morning. The cream cheese filling can also be made a day in advance, if you like. You will need a small (6-7 inch) non-stick skillet for this recipe. 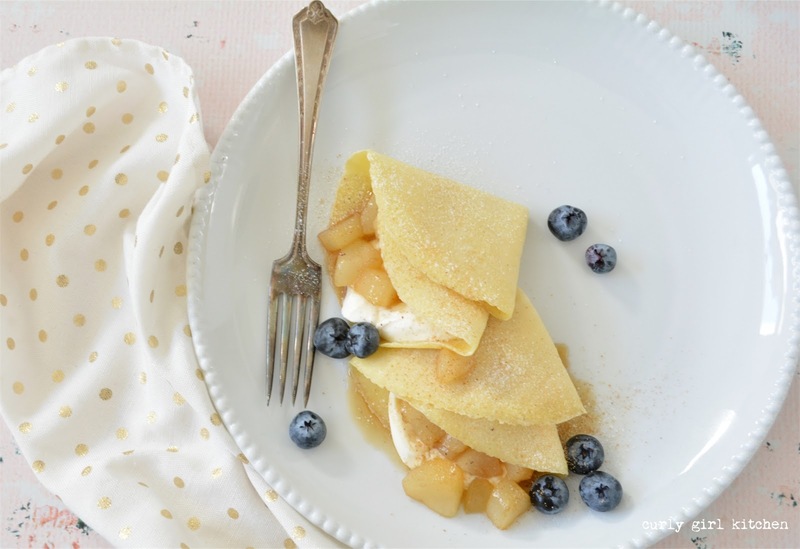 The crepes will not slip easily out of the skillet if it's not non-stick. In a bowl, whisk together the milk, water and eggs. Whisk in the flour, salt and nutmeg until smooth, then whisk in the melted butter. Cover and refrigerate overnight. When you are ready to cook the crepes, line two large baking sheets with parchment paper, and set your oven to the warm setting, or around 200 degrees. The batter will have separated - whisk again until smooth. If you have any small lumps of flour in the batter, pour it through a mesh strainer to remove the lumps. Place the skillet over medium heat and add about 1/2 teaspoon butter, using a pastry brush to evenly coat the bottom of the skillet with butter. When the skillet is hot, measure 1/4 cup of the batter into the skillet, and swirl it gently so that it covers the bottom of the skillet. Let cook for about 1-2 minutes, just until the edges are slightly lacy and the center of the crepe is set (do not flip over to cook the other side); the crepe should be a very pale golden color underneath. Use a spatula to gently loosen the edges of the crepe from the skillet, then tip the skillet to slide the crepe onto the baking sheet. Repeat with the remainder of the batter, buttering the skillet in between each, until you've cooked all the crepes. You should get about 9 crepes. 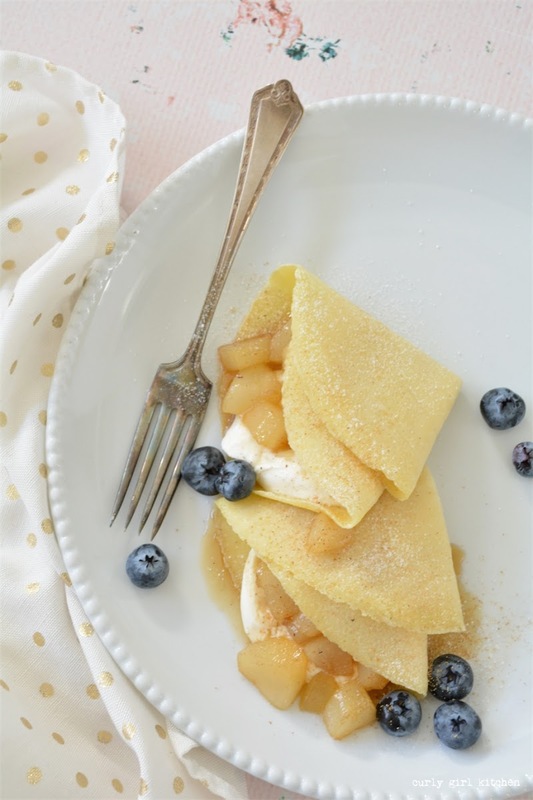 Place the baking sheets in the oven to keep the crepes warm while you make the fillings. Combine all ingredients in a bowl and use an electric mixer to beat for 1-2 minutes until smooth, thick and creamy. In the same skillet you used to cook the crepes, melt 2 tablespoons butter over medium-high heat. Add the brown sugar, pears and whiskey. Cook for several minutes, stirring occasionally, until the liquid is reduced to a syrupy consistency, then remove from the heat. 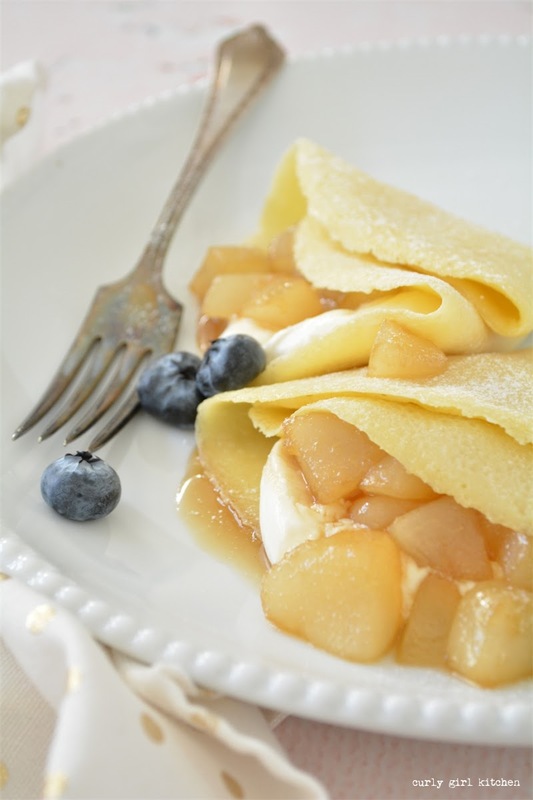 To assemble the crepes, spoon a dollop of the cream cheese filling onto one fourth of a crepe. Top with a spoonful of the pears. Fold the crepe in half, and then in half again, so it looks like a triangle. Garnish with powdered sugar, nutmeg, and blueberries.